I'm trying to sort out an issue with my Gottlieb Space Orbit and am in need of a little help from the experts. I'm more experienced with early Solid State machines than I am with EM's, so this has been an interesting learning experience. I've set myself up with a full EM project next (once I complete my current SS project) and am using the Space Orbit as an intro to exploring (and fixing) EM's. Some background first. I purchased the Space Orbit about 14 months ago - it's mostly run fine, but a few issues slowly set in over that time. Nothing that would be considered a show stopper as I've been able to continue playing it. Space Orbit is an Add-a-ball machine that was exported to Italy, before making its journey here to Australia a few years ago. Two weeks ago I decided to give the machine my full attention and fix the issues that had set in. I spent time researching similar issues people had. 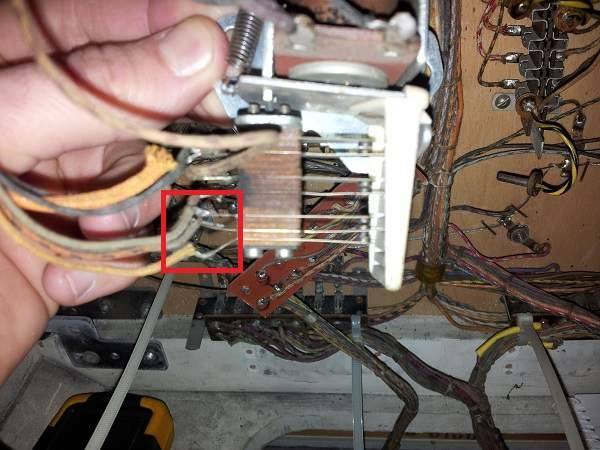 I found lots of good information here, google groups, various websites and also watched plenty of videos on the Pinball Ninja Webzine (I subscribed sometime last year - excellent content!) to become familiar with EM's in general. I had also purchased a copy of the schematics to aid with the trouble shooting. While looking at the 5 ball mode I discovered two issues I wasn't aware of. I actually didn't realise you could switch it to 5 ball mode as first. I had only every played on add-a-ball. Only once I started working on it I found that it could be swapped between add-a-ball and 5 ball mode (I think this can also be called Novelty mode?). The difference being in 5 ball mode you don't get free balls, but bigger points for hitting lit WOW targets. The first 5 ball mode issue I discovered was the lightbox not advancing - as mentioned above, I fixed this (9th pos switch). The second issue is with the number of points awarded when you hit a lit wow target - which is where i'm currently at. Right now, you will always receive 50,000 points, regardless of the settings on the score adjust jones plug. Even with no score adjustment settings applied, the machine will still award 50,000 points. If I do a similar test in add-a-ball mode, the game will correctly award a free ball at the set scores - or if no scores are set, then no free balls awarded. So the issue is isolated to 5 ball mode. Given that add-a-ball more runs fine, I'm guessing that that majority of the machine is running without issue - I'm assuming that 5 ball mode would also run through all the same relays, etc. But somewhere, there is a small fault that's forcing the score adjust setting to be ignored and override it with 50,000. Perhaps I'll detail what I know from investigating the issue, then the EM experts here can maybe point out flaws in my searching and/or things I've missed along the way. I wasn't sure where to start with this issue, but I figured the score adjust plugs were a good a place as any. Here there are two wires running to it - orange and green. Both are connected to a single plug. Each also has an extension to allow for a second score value to be set. Through some testing I found that the orange wire sets the scores for the add-a-ball mode, while green does nothing (I'm thinking that the green wire would be for setting the 5 ball mode wow score adjust - maybe?). For example, in add-a-ball mode, with the orange wire connected to the 10,000 and 20,000 point plugs - the game will award a free ball at 10,000 and then again at 20,000 - but no more after that (unless you roll the score then you will get free balls at 110,000 and 120,000 should you reach those 10,000 thresholds again). I repeated the same test but with the green wire connected to the 10,000 and 20,000 plugs. No free balls were awarded at all. This wire appears to be ignored in add-a-ball. I then switched to 5 ball mode. I connected the orange wire to 10,000, activated WOW mode and hit a lit target - this awarded 50,000. I then swapped to use the green wire and repeated the test - again 50,000. I then did a final test with both orange and green wires removed - 50,000 points were still awarded. The next thing I was interested in was where do the 10 score adjustment wires run to? I traced these to the small circuit board that is connected to the 10,000 point decagon score reel. 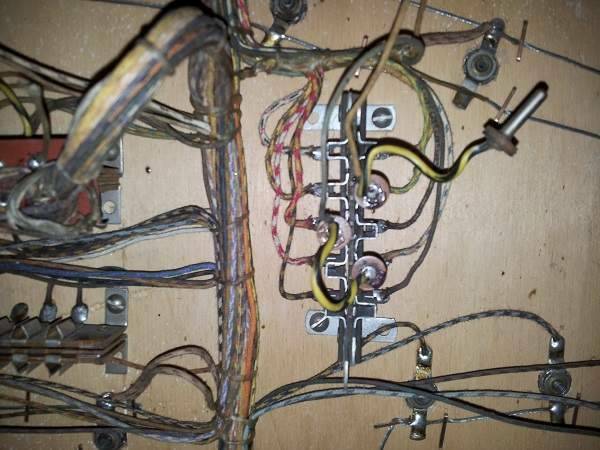 Where do the orange and green wires (used to set the score adjustment) run to? 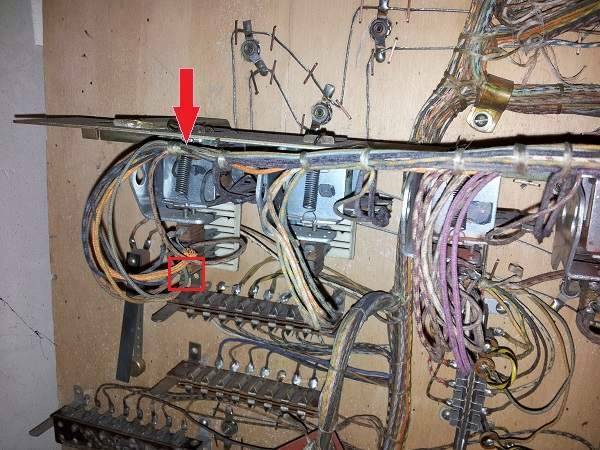 I traced these to a make/break switch on a small relay in the headbox. The relay is unmarked, so am not 100% on what letter assignment it has. The wire connected to the middle blade on the make/break switch must also run somewhere then. I traced this back to a lug on the add-a-ball jones plug. This wire does not connect to the 5 ball jones plug which sits above it, which makes me wonder how the green wire can be used for setting scores. 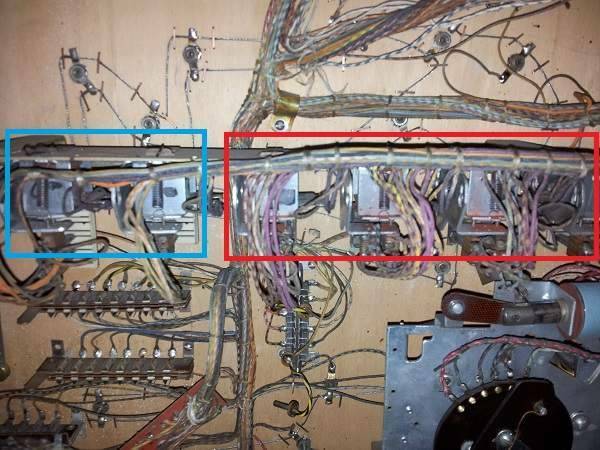 The jones plug for the 5 ball mode looks a little different, with some of the lugs having two wires connected and one has a yellow/black wire connecting two lugs together. There are a lot more wires running to this than the add-a-ball jones plug. This looks different to the other jones plugs in the head box. Maybe it's correct? I don't have the EM experience to know. There are 5 small relays in the headbox. The two on the left appear to be related to the score adjustment (and maybe other features) - while the other 4 are used to activate the 10, 100, 1000, 10000 score relays. This is where I'm currently at and I'm not sure how to proceed in diagnosing further. I'm assuming that the game allows you to set how many points awarded for hitting a lit WOW target in 5 ball mode. Is this a reasonable assumption to make? (or maybe I'm chasing an issue that doesn't exist? Which would make me wonder about that green wire connected to the settings which is currently ignored). I'm hoping you guys can offer some ideas / thoughts / suggestions from your experience. If more photos are needed, I can take more. welcome to the pinside-forum. 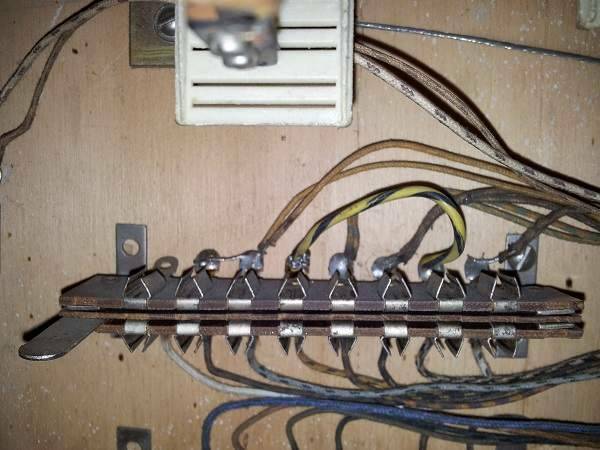 Yes, in this subforum we talk about "a specific pin has one (or 2 or more) specific problem / fault". Writing Your post-1 You made a mix of information and questions. Great, you have a schema - do You also have a manual ? 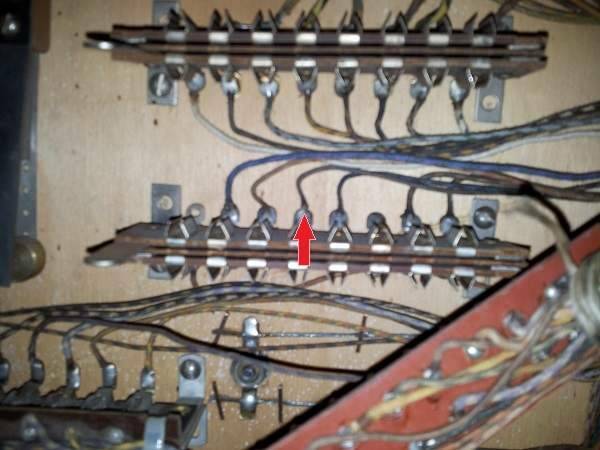 I do not know, if we are allowed to show "part of Gtb-Paperwork" when discussing "faults / problems" on Gottlieb pins. I believe "Your main problem" is the "mode" of playing a pin. Here - http://www.ipdb.org/glossary.php#Add-A-Ball they say "a TRUE Add-A-Ball pin" has the Backglass with the text "Balls to play" - Your pin is a true Add-A-Ball pin: http://www.ipdb.org/showpic.pl?id=2255&picno=63818 (here the game starts (counter is Zero) on the fifth ball -> You loose that ball -> ball-4 -> ball-3 ... ball-1 -> Game-Over. Novelty Play: http://www.ipdb.org/glossary.php#N -> A "True Add-A-Ball" from Ball-5 down to ball-1 -> Game-Over - You may make millions of points / get EVERYTHING on the playfield --- You will not be rewarded (no payout / No Replay(s) by the counter / No Replay by a Special / No Replay by Number-Match-Unit / No Extraball - simply NOTHING). Many regular pins can (also) be set to Novelty play - the only difference to "a true Add-A-Ball-pin set to Novelty-play": A regular pin set to Novelty play: It starts showing Ball-in-play-1 -> ...-2, -> ...-3 -> ...-4, -> ...-5, -> Game-Over. So playing a pin in Novelty play: YOU must reward Yourself: Take along a piece of paper and note "Personal-High-Score-Points (example) 87430" and "Personal-High-Score-in-playing (example) 4 Minutes and 35 Seconds for 5 balls (played)". You must study carefully the schema: where are Jones-Plugs drawn in the schema - and what effects do result of the different Plug-ins ? I am interested to have a look at snippets of the schema (dealing with "Jones-Plug-Settings") - I DO NOT KNOW IF YOU ARE ALLOWED TO SHOH IN PINSIDE SNIPPETS OF GOTTLIEB SCHEMA. Question to "USA-pinsiders": what is allowed / what is forbidden ??? I could understand issues with posting (or making available) a full scan / photo(s) of the schematics - but thought a small snippet of the specific area (score adjustment) to the problem might have been acceptable to aid with understanding. I'm sure i've seen other snippets posted here, but perhaps those were not for Gottlieb machines. I've removed the photo of the score adjustment section for now in case there is an issue. The post was made yesterday and possibly already seen by moderators who I imagine would have edited it out (or contacted me). The issue obviously isn't a critical one - you can still play the game. I'd like to get to the bottom of it though so who ever owns the machine after me in the future has the option of adjusting the WOW "reward" on 5 ball mode (personally I'd prefer the add-a-ball mode). Thanks for posting the links. I'll keep digging and see what else I can find out. I live in Switzerland (I do not want to run into problems with "US-Laws"). Here: https://pinside.com/pinball/forum/topic/gottleib-spirit-of-76-schematic -> post-4 / post-7 they say "Steve Young at Pinball Resource has the rights on Gottlieb papers" from http://www.mondialgroup.com/gottlieb.htm . Jesder - can You show a picture like: http://www.ipdb.org/showpic.pl?id=1853&picno=22879&zoom=1 - of Your "Space Orbit Backglass" ? Here http://www.ipdb.org/glossary.php#Add-A-Ball : the WOW-Feature is mentioned. If You try-out different settings of Jones-Plugs: Have the pin in "Add-A-Ball" (in Novelty Play a lot will not be working - as the player shall not be rewarded). So is a summary of the issue that when in 5 ball mode the WOW target always adds 50k point and you feel this is wrong? You think the point adjust threshold settings should influence what is awarded? I can't see how this would work - the adjustment thresholds (when in replay and add a ball modes) take signal from the score reels and when this completes a circuit "something" - a replay or add a ball occurs. How could this work with a single target. The scores would need to aligned (to the settings) and then the target be hit, once the scores no longer align the circuit is no longer made. Maybe what you think is a problem isn't? I've seen many fragments of schematics posted on here, on other forums and in books, so I'd say post away. Moderators will ask you to remove it breaches rules. andrew, i thought you had a copy of the schematics? in post-1, pic-2 you show a unmarked relay - when You manually act (at several times) in game-play: do You have some effects ? Post Time http://www.ipdb.org/machine.cgi?id=1853 has "Novelty Play Mode" "Add A Ball Mode" "Extended Play Mode" - maybe Your pin (also) has (rare, uncommon) "XYZ Mode" ?